I was tickled pink when I was asked to bake my nephew Gabe's cake for his seventh birthday this year. Truthfully, I was expecting something along the lines of Star Wars or a Nintendo character. A dragonfly?? WAY COOL!! 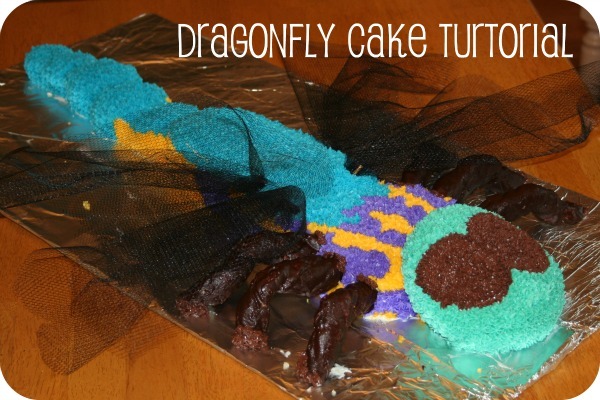 A quick google search of 'dragonfly cake' didn't turn up very many results. So, here's what I came up with. Hopefully it makes sense! For the 6" sphere, I used Wilton's sport ball pan set. Alternatively, you could use a second 6" cake and trim it into a spherical shape. Food colouring. I use concentrated gel colouring to get a deep, rich colour. For this cake: violet, royal blue, leaf green and golden yellow were used. White cake mix. I generally use the 'just add eggs, oil and water' mixes when I make this kind of cake because they release easily from the pan and always turn out great. If you get fantastic results with a cake made from scratch - USE IT! One box of cake mix was enough for this cake. Note: these are best made the day before cake assembly to give the chocolate ample time to harden. And to save your sanity. 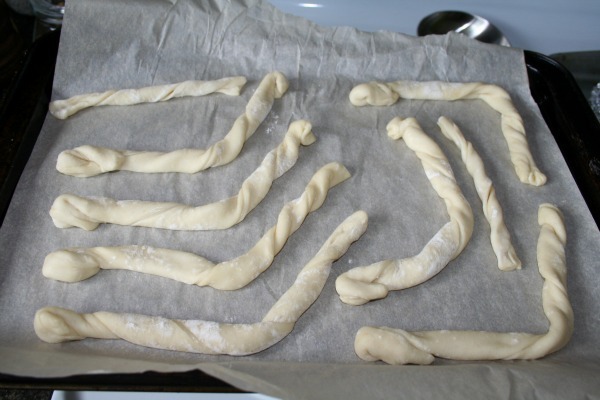 Thaw out the sheet of puff pastry and cut into 1" strips width-wise. You should get 7 strips (you'll only use 6, but always good to have a back-up in case one breaks...or gets eaten) and a little bit left over. Place on a cookie sheet lined with parchment paper. 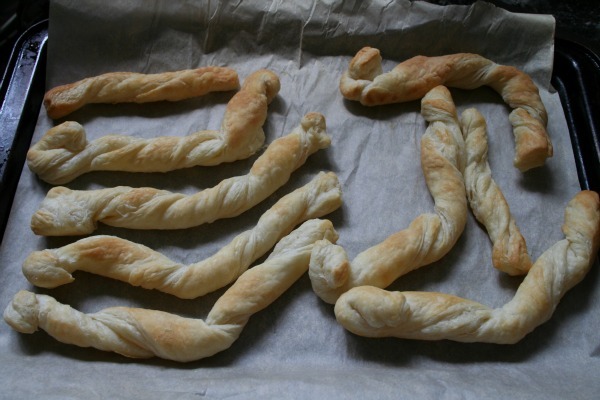 Bake for 10 mins or until they are golden brown. Let cool. Finely chop chocolate. Fill sauce pan with 1" of water. Place glass bowl on top, ensuring the bowl does not touch the water. Bring to a simmer on medium heat, make sure water doesn't boil! Add chocolate and let stand until 3/4 of it has melted. 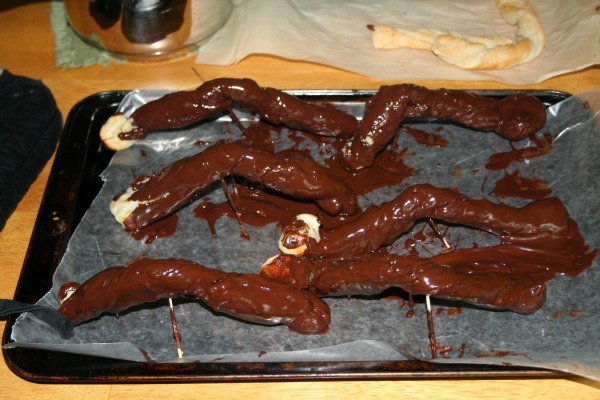 Remove from heat and stir with metal spoon until the chocolate has thoroughly melted. 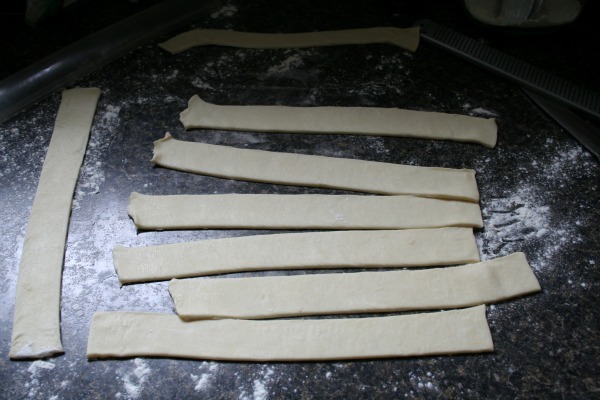 Working quickly, do whatever you have to do to get those puff pastry legs covered in chocolate. I used a mix of dunking and drizzling to get even coverage. Shake off excess and place on a cookie sheet lined with wax paper. To stand the legs up, I stuck toothpicks on either side at the joint. Be careful, the chocolate makes the pastry go soft. Yes, you will be covered in chocolate at the end of this process. Place in a cool place and allow to harden. They can be stored in the fridge overnight. Grease and flour cake/muffin pans. Mix cake batter according to directions. Evenly divide batter into three separate bowls. In each bowl, add either violet, leaf green or golden yellow food colouring until desired colour is achieved. Keep in mind, the colour of the batter will be the colour of the cake. 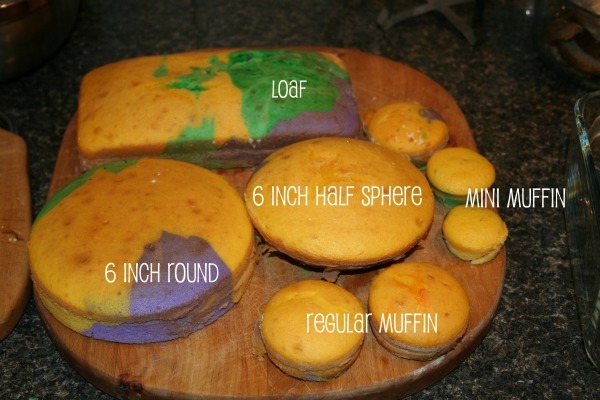 To make a marbled effect, place a gigantic spoonful of one colour of batter into each of the cake pans. Use a little spoonful for the muffin tins. Otherwise you'll just get a mono-coloured cupcake and that's no fun. 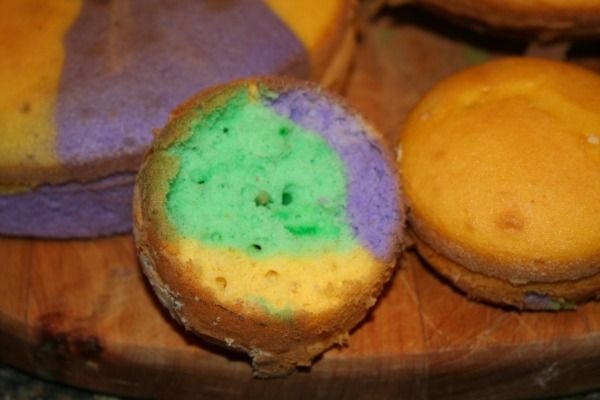 Repeat with remaining colours until all of the batter is gone. The muffin tins should be filled half way (I used three regular and two mini), the round, sphere and loaf pans need to be divided as evenly as possible. Tap each pan on the counter to remove any air bubbles and even out the batter. Add a little bit of water to the empty muffin cups. Place pans in preheated oven (according to cake mix directions). At 350'F, the mini muffins baked for 10 minutes, regular muffin, sphere and round cakes for 20 minutes and the loaf for 25 minutes. 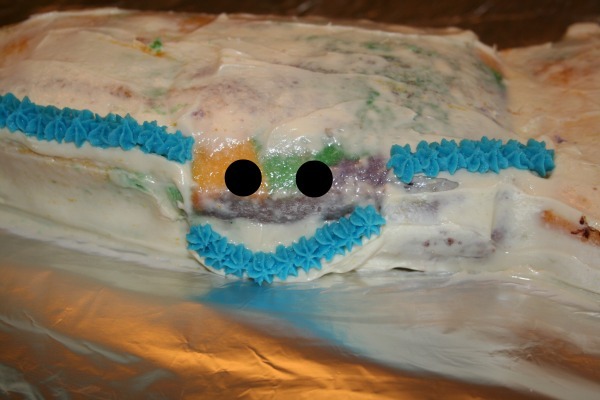 Baking times vary from oven to oven, so make sure you check often to avoid a dry (*blech*) cake. The cake's good to go when you stab a toothpick into the middle and it comes out clean. Let cool completely. Can be stored in an airtight container overnight if needed. 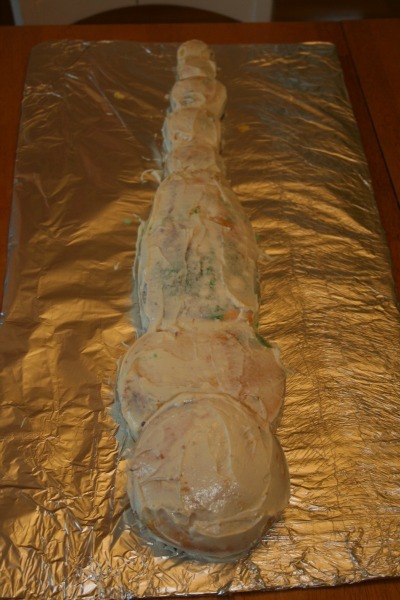 This cake is not just long, it's stupid-long. ("How long is it, Anne?") It's so stupidly L-O-N-G that you'll have to fashion your own cake board. I laid out the cake, trimmed it, measured it, and cut a piece of cardboard to fit. Cover it with aluminum foil and voila! A stupid-long, what-will-you-ever-use-it-for-after-this cake board. 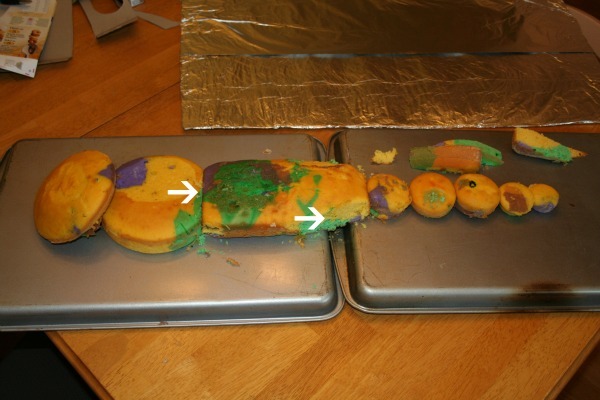 The parts I trimmed off the cake are marked with arrows. I sliced off the bottom of the round cake to sit flush next to the loaf, and I tapered the end of the loaf to meet the first cupcake. The next step is optional, but I decided to crumb coat the entire cake. This is a thin layer of icing (I used the store bought vanilla for this) spread over the cake to seal in any stray crumbs. It also gives the piped icing something to stick to. Ideally, the icing should crust over. If you're working on this cake on a hot, humid day without air conditioning, this will not be the case. Instead the crumb coating will allow the piped icing to slide off the cake with great ease. Making the best out of a crappy situation with photoshop. My initial reaction was "Noooooooooooooooo!" I filled in the blank space on the body with violet. Using a toothpick, I traced the eyes on the head and fill in with size 16 chocolate stars. 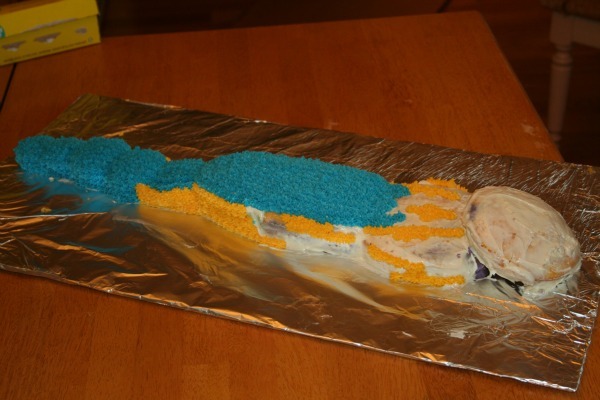 The head was finished with icing tinted with royal blue and leaf green to make an aqua-ish colour. Forgive me, but I didn't get photos of further assembly. I was pressed for time, my kid was screaming and....well, I just plain forgot. I hope I can do a decent job of describing the next few steps. Okay, the legs. They ended up being a little long, so I trimmed them down to sit nicely on the cake board when inserted into the cake. All six legs are inserted with a toothpick into the thorax. Remember insect anatomy? No? Alrighty, thorax = round cake. I piped a bit of chocolate around the base of the legs and at where they met the body to tidy it up. The wings. Oh.my.god. The wings....I almost had a wingless dragonfly. I tried SO HARD to make the wings edible. My first attempt was sugar glass. Fail. Way too heavy. Then I thought maybe a wafer-thin cookie. Fail. Too brittle. Icing on cardboard cut outs? Meh....not so great. It worked for the bumble bee at the right. Not so much for the dragon fly. So, I had 10 minutes until I absolutely HAD to leave for the party. I had a baby in desperate need for attention. I had two options. Black tulle or nothing. To make the wings, I cut a 14 x 8" length of tulle, bunched it, rolled it around a trimmed wooden skewer (about 2" long or so), taped it and stuck it into the cake behind the legs. I did that three more times, stood back, looked at it and.......Yes!! It worked! It looked like dragonfly wings and I was done! I brought some icing to the party and wrote out a birthday message using a #3 decorating tip on the foil. 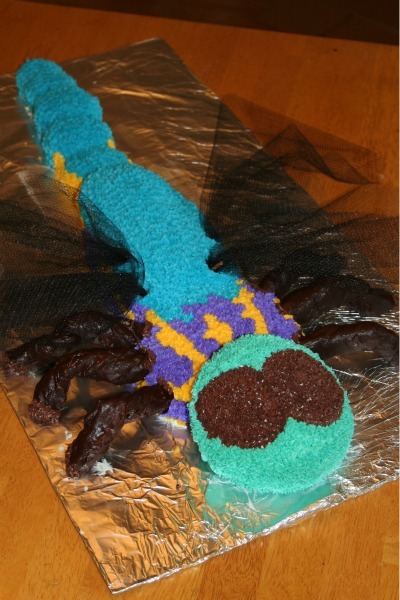 If any of you make a dragonfly cake...or any insect cake...be sure to share it with me! August is a big birthday month at our house, stay tuned for more birthday posts! 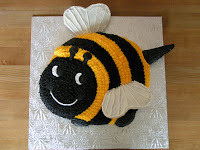 So you happen to have a tutorial for your Bee cake?